My life, from the time I first squinted at daylight has been with horses. I admire every step that crethure makes ... To me, the horse is man's greatest, most useful, faithful, and powerful friend. He never whines when he's hungry or sore footed or tired, and he'll keep going for the human till he drops. Winner of the 1927 Newbery Medal, Smoky the Cowhorse is the story of a mouse-coloured colt who was born on the range and grew up to become a sturdy and reliable cowhorse. Will James does a fine job of describing the world from Smoky's point-of-view and that of the cowboy's as well. His book quietly teaches the reader much about the care and treatment of horses without being overly didactic. Throughout, his admiration for Smoky shines clear; readers warm to the plucky horse and fear for his safety as his end seemingly nears. Happily, Smoky's heart does not falter; a happy ending for horse-loving readers. 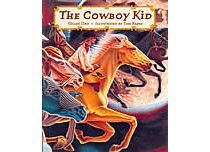 For books about cowboys, visit my blog, Interesting Nonfiction for Inquisitive Kids. A barefooted city boy pretends to be a cowboy in this fanciful picture book. When he falls asleep, he dreams about magical horses that come alive and stampede across the night sky. Double-page spreads by artist Tom Kapas add to the suspense. A particularly dramatic picture shows horses leaping out of paintings in a grand museum. However, the picture that closes the book is a bit frightening. It shows a child in bed, surrounded by stuffed animals and small horses dancing about the pillow. The child is awake, with an open-mouthed expression of either awe or fright; it's a little hard to tell. It may scare very young readers. In the early 1980s, thousands of Jews, who called themselves Beta Israel, or "House of Israel", tried to flee religious persecution in Ethiopia. Israeli emissaries advised them to seek shelter in Sudanese refugee camps, where they would be spirited out to Yerusalem by plane. Wuditu and her family risk their lives to make this journey. In the camp, she and her sister are separated during a raid, and both sent back to Ethiopia. Afraid that they will be never make it to Israel, 13-year-old Wuditu decides to look for the faranj, the foreigners, who will help them. But alone, and with no food or shelter, Wuditu barely survives. She eventually finds work as a servant, only to find herself trapped for two years as a prostitute and slave. When the villagers discover that she is a falasha, a hated Jew, her life is in danger until a stranger arrives to rescue her. Based on real events, Wuditu's story is told with harrowing, unflinching brutality. The author, Judie Oron, writes in a journalistic style that provides some needed distance from the pain of Wuditu's life, without diminishing its importance. A disturbing book. When sixteen-year-old Gloria fails most of the subjects on her final exams, she realizes she'll never be a Somebody. She's a Nobody stuck in Accra with no running water, an unemployed father, and an ill mother. So her family are thrilled when a distant relative, Christine, offers to take Gloria to Kumasi to look after her young son. In exchange, Christine will pay for Gloria's future schooling. Life in Kumasi is better than anything Gloria has ever experienced. She loves Christine's modern apartment, with its television and indoor plumbing. She makes new friends, joins a youth band at church, and, tutored by Christine, is learning how to read. She calls Christine "Sistah" and believes that they are as close as real sisters. But Kumasi is also full of temptations. Gloria's friend Bea gets her interested in partying and fashion, the owner of a popular clothing shop encourages her to buy on credit, and the smooth-talking Dr. Kusi offers Gloria rides in his sports car. He proclaims his love for her and even gives her money. Things fall apart when Bea steals from Christine, who blames Gloria for the theft. On top of that, Dr. Kusi is seeing another woman. Thus Gloria realizes that things are not as rosy as they seem. Christine is not really her sister and some men are not to be trusted. Between Sisters is a different kind of coming-of-age novel, set in a country (Ghana) that few teens have visited. Badoe immerses readers in a whole new culture with unique attitudes, customs, and cuisine. She also has Gloria deal with some difficult issues, such as AIDS, teen pregnancy, and unpaid work. The novel is sure to have young readers pondering life choices, especially when faced by Gloria's incredible naïveté. It clearly shows the disadvantages of poverty and poor education, without being too depressing or heavy-handed. A thought-provoking novel. Lucy Vakovik and her mother finally have an onlyhouse: a single, detached family home. Lucy is even more excited at starting a new school where she hopes to make a million friends. But she's so determined to be a real Canadian, that she ends up making a series of really bad choices when she joins the school bully's gang. Comic relief is provided by Lucy's mother, whose poor English and old-Croatian ways embarrass her daughter to no end. But much to Lucy's surprise, people actually like her mother, enabling Lucy to finally accept herself for who she is. At the end, Lucy easily breaks free of the bully's clutches, whose troubled story is not resolved. Despite this minor plot problem, Toten's book is quite good. The action and feelings are genuine, and the setting - 1968 Toronto - is realistically and vibrantly captured. For Valli, the best day of her life was finding out that she had no family. Why? If you've spent your whole life picking up coal and being mistreated by people who you thought were your aunt and uncle and cousins but actually weren't, then such a discovery is actually freeing. With no family, Valli can do whatever she wants. And she chooses to leave. Valli finds herself living on the streets of Kolkata. At first she is scared, but, as an old man tells her, if she wasn't scared, she would just be having an ordinary day. So she decides to make the best of things, "borrowing" what she needs, like food and blankets, then passing them on to someone else who needs it more. She lives like this for months, until she meets a doctor who notices Valli's cut and injured feet. Dr. Indra wants to keep Valli in hospital until her leprosy can be cured. But Valli is frightened of the other patients, whose deformities make her think they are monsters. Valli runs away. However, during her short hospital stay, something was awakened in Valli - her curiosity. It makes her think that maybe she could have a better life. A well-written story that fosters awareness in its target young audience. Readers will gain an understanding in what it means to be among the poorest of the poor and how difficult it is to find trust in others. The book also shows how fear and ignorance can lead to the marginalization of the weak and the ill.